The boat launch can be a tough place, especially if you are a beginner on a busy lake. People are anxious to get onto and off of the lake. You don’t want people to be sitting there waiting on you, so the temptation is to go as fast as you can. This can be a huge mistake for many though. Even experienced boaters can make rookie mistakes that are downright embarrassing in front of all the other boaters. Personally, I’ve made two mistakes that were somewhat embarrassing. My first wasn’t a big deal – I forgot to put in the boat plug. I’d guess most boaters have made this mistake at one time or another. Water started gushing in the boat. Once I saw it I quickly jammed in the plug and started the bilge pump, which drained out the water in about five minutes. No real harm done. My other big mistake was while I was pulling off a river. The launch was gravel and had no dock. I walked out on the tongue of the trailer, but while I was adjusting the boat I lost my balance. Unfortunately my shoe got stuck on a bracket so instead of stepping down and getting my leg wet up to my knee, I fell back first and ended up totally submerged in 1 1/2 feet of water. I’m the kind of guy who is able to laugh at my mistakes, so even though I ended up soaking wet and embarrassed, I still had a good laugh at my own expense. A DBA can certainly see the lesson in this. If you go too fast you make mistakes. You need to be very careful and pay close attention to details. One way to cover yourself is to maintain backups. I recently ran into a warning in Oracle Enterprise Manager that said I was using 97% of the recovery area free space. A quick search found that if the used space got up to 100%, the database would cease to process transactions. I wanted to see within the database what my db_recovery_file_dest_size parameter was set to. I ran a quick query and found that it was set to 350 GB. Next I queried the v$recovery_file_dest to see the total space, used space, and directory where I was storing the backupsets. I checked the directory and found it quite full of back files. Taking backups is not enough – you need to be aware of what is happening to the backups. Testing recover-ability is also a great idea! I haven’t done a lot of muskie fishing in the past month. It’s been a busy summer (as always), and I’ve been sticking to short fishing trips for “lesser” species. I made a couple trips to little cedar this last weekend and both were fun and fairly successful. The first was with a friend from church and his young son. They caught several bluegills and the boy had a blast, although he probably enjoyed the snacks more than the fishing. I caught a couple northern pike, the biggest of which was 19″. It was almost big enough to keep, but I ended up letting it go. The next night I took my five year old out for an evening of fishing. We got some leeches and were targeting walleye, but we only ended up with some largemouth bass. I think we were getting bites from walleye, but we didn’t manage to hook any. Below is a picture of a nice largemouth bass my son took with a skitter pop. The fish had a couple spectacular jumps before making it to the boat. Yesterday was one of the most challenging days I’ve had with my current employer. We’re in the process of changing managed service providers for IT infrastructure, and changes like these are never easy. The problems yesterday stemmed from the backup solution changes. Both our old and new MSPs use a disk image-based backup solution, but they are different brands. In a previous post, I’ve made it clear that I am not a fan of image-based backups for databases. Most relational database management systems have their own backup mechanisms, and I understand and trust these backups far more than the image backups. However, different backups can serve different purposes and in this case, I have no choice in the matter. The problem occurred over the course of the morning. I got a report that our Oracle database was not available. Upon checking, I found I could not access the database. I remote desktop-ed into the server to check the service and found connectivity spotty. I recycled the Oracle database service, but that did not fix the issue. Since the connectivity was slow and spotty, I suspected either a network or disk issue. The new MSP was able to add some diagnostics to the server and we found no hardware issues with the disks. There also didn’t appear to be any network connectivity issues. At this point we attempted a server reboot. This didn’t help. Since Oracle database is pretty much the only thing running on the server, we figured the problem either had to be Oracle or the antivirus software. We disabled both and rebooted the server again. This time it appeared to help. We brought Oracle back up but left the antivirus down. Everything was working fine for about 45 minutes, so we figured there must’ve been some sort of conflict between Oracle and the antivirus software. To win the worst timing of the day award, I sent out an all-clear email to the users about one minute before the server started breaking again. We saw the same symptoms as before where we had spotty connectivity and extreme slowness. After yet another reboot we left both Oracle and the antivirus off. When slowness occurred yet again, we knew it had to be something else that was running on the server. A quick check of the Programs list showed that the image-based backups for the previous MSP were still running (as they should have been). However, that was enough of a clue for a lightbulb moment. In preparation for the new backup solution, a disk defragmentation had been run the previous night. The current backup solution did a single full, then continuous incrementals afterward. The defragmentation had scrambled up all the bytes on the disk, resulting in an incremental with lots of changes to process. In looking at the backup manager, we found the next incremental would take a full two days to process. We also discovered that each time we’d had problems, there was an incremental backup scheduled to run. Fairly confident we’d found our culprit, we disabled the backup and turned Oracle and the antivirus software back on. As expected, there were no issues for the remainder of the day. In the end, the pressure of the database trying to use the disks in addition to the backup solution proved to be too much for the server to handle. Through the use of methodical testing, we found the problem and fix it. 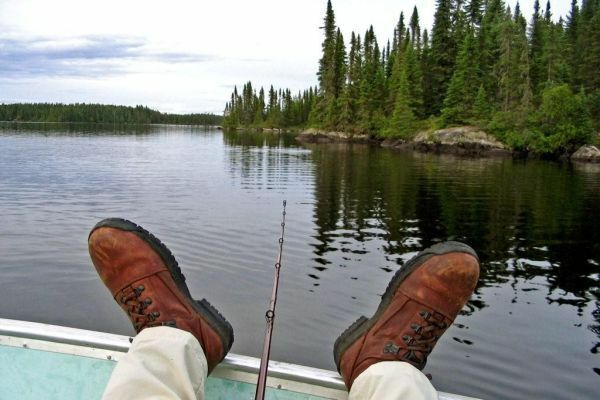 This Saturday is the fishing opener here in Wisconsin. The DNR designates some time in spring when the only fishing allowed on most inland waters is panfishing. This rule was created to protect the fish, since most species spawn in the spring. I can’t wait to get out there on Saturday and try to catch some opening day fish! 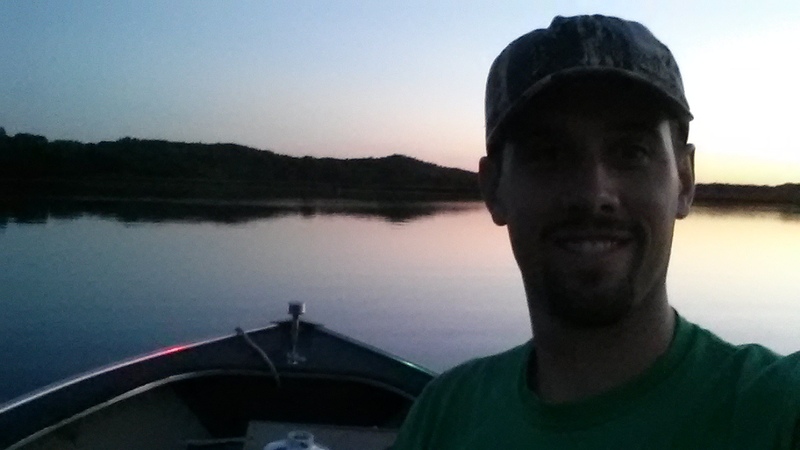 This is my first opener owning my own boat, so I can certainly say I’ve never been looking forward to a fishing opener this much. Hopefully my next post will have a picture or two of a beautiful 2015 muskie. At 2:53pm a full backup was performed. After that full backup, users continued to do work and the database continued to grow. At 2:54pm a transaction log backup was performed. Followed by more changes to the database. At 3:01pm another transaction log backup was performed. Followed by more changes to the database. At 3:12 another transaction log backup was performed. Followed by more changes to the database. At 3:19 a catastrophic failure occurred causing the operating system running SQL Server to reboot. Let’s blame it on a power surge, or maybe it was just a DBA who accidently bumped the power cord. I like the power surge idea, so that I don’t get blamed for kicking the power cord. 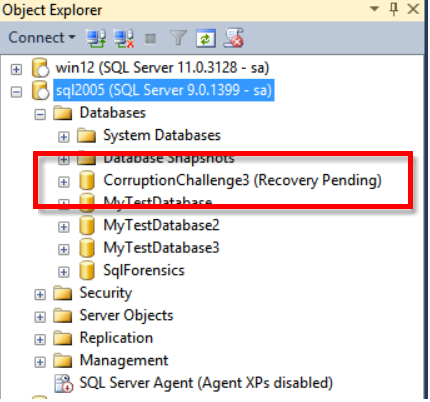 After the server rebooted, several other databases on this SQL Server recovered just fine, however the CorruptionChallenge3 database would not come on line. 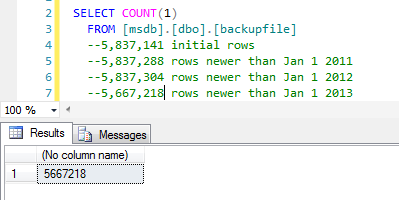 After examining the SQL Server data directory, it was discovered that the single .mdf file for this database was gone, missing, just not there. 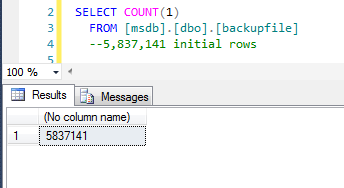 The only thing that remained on this SQL Server was the .ldf file for this database. Steve included five files needed to recover all the data – the last full backup, the three transaction log backups that were taken between the last full backup and the disaster event, and the log file. Log file ‘R:\SQLLogs\CorruptionChallenge3_log.LDF’ does not match the primary file. It may be from a different database or the log may have been rebuilt previously. At this point I remembered some Oracle training I’d done regarding Log Sequence Numbers (LSNs). When connecting a database, the LSN in the log has to match the LSN in the data file. At this point I couldn’t think of what else to do. I could not think of any way to get the data out of the log file without taking a backup of it, and I couldn’t take a backup without first attaching it. I thought about it for another 15 minutes and then turned my attention to other tasks I had to get done that Saturday. The key here is to use the NO_TRUNCATE option. With this I am able to take a log backup, and now have one full backup and four log backups, enough to restore the database with no data loss! I have a busy weekend coming up since it’s the fishing opener on Saturday, but I hope to be able to work on Corruption Challenge #4, coming up on Friday. I’ve always wanted to catch a truly fat fish. In fall many species of fish feed heavily to put on fat for the winter, and when catching them you can see the stomach pushing the belly of the fish out and making them look quite bloated. This is the reason that fishing in the cold wind and rain of late fall is worth the pain and sacrifice. I recently ran into an issue where I noticed the MSDB database on an instance was growing quite bloated. 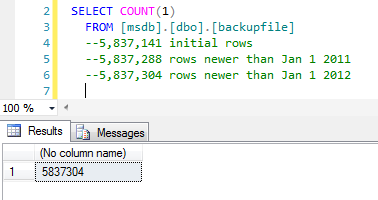 MSDB database contains data related to SQL Agent jobs, database mail, SSIS packages, Backups, and Maintenance plans. In most cases it should be fairly small, but I observed it at close to 4 GB. I decided to get a baseline of how many rows are currently in the backupset table, then start deleting rows using this stored procedure. For this instance we never have to look at backups older than a month at the very most, but to be safe I would prefer not to delete backups that are too recent. I decided I wanted to reduce the record count by about 75%, and then monitor growth to see how much data I should actually keep. I quickly realized much of this bloat is due to a change in the backup configuration we made late last year. In order to facilitate disaster recovery we had to abandon our native SQL backups (NO!) and go with a third party image backup system. I didn’t like this because I prefer to be in charge of the backups instead of leaving them to an outside vendor, but our cloud backup/disaster recovery area was only able to handle image backups, so I had no real option. Since we are busiest late in the year, we ended up having to change the transaction log backups so they are run every minute. This is the only way the image backup would work without slowing the system, since it requires an I/O freeze when it takes the backup, and the backup capture all changes since the last backup. Smaller intervals mean less changes and a shorter I/O freeze time. I was able to trim the rowcount enough such that there is significant empty space in the database. 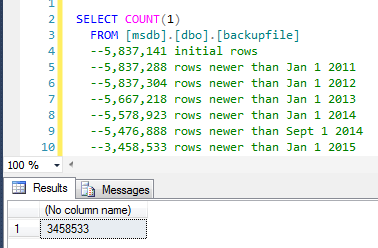 Next I set up a SQL job to delete all records older than 3 months and run it once a month. Now I don’t have to worry about MSDB continuing to grow.